I had never heard of beer can chicken until I went to a good friend's BBQ last summer. This Aussie swears by this method of grilling chicken on the barbie, and once you've tried it, there's no turning back. Drink half a can of beer, stuff it inside a chicken and grill - this recipe is fool-proof. You don't need to get any fancy beer can holder for the grill either. The steam rising from the beer makes the chicken insanely moist (mine was just completely falling off the bone), and the yeast in the beer helps make the skin all nice and crispy. My Aussie friend recommends using Guinness or a stout beer. As far as seasoning goes, this is where you can play around - use your favorite spice rub, or keep it simple with some olive oil, salt, pepper and rosemary. And I have to be honest...the picture you're seeing is not mine. Why? Because after smelling roast chicken in my apartment for 2 hours, I realized I had forgotten to take a picture just as I had finished picking the meat off the carcass...and stuffing my face. Shameless, no. Delicious, yes. - Mix salt, pepper and herbs. - Remove innards from whole chicken and pat dry. - Rub inside with olive oil and then spice mixture. Do the same with the outside. 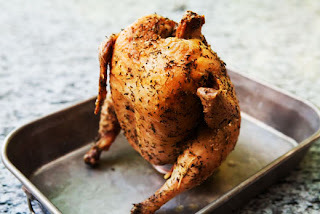 - Place chicken over 1/2 can of beer - position the legs in front of it so it can balance nicely. - Here are some instructions for making this recipe on the grill. - If you're making this in the oven, be sure to put the chicken in a roasting pan to catch all the drippings. Set your oven to 350, place chicken on the lowest rack and roast for about 2 hours. - Let the chicken rest for at least 10 minutes before carving into it.